Tucked away off Corn Neck Road, you will enjoy this light filled contemporary home, offering split level living at its best. A custom built home with detailing and craftsmanship, this property features a gourmet kitchen, 1/2 bath and gracious living/dining room which opens to a spacious, multi level deck spanning two sides of the house. Entry level includes two air conditioned bedrooms, one a master bedroom suite, one a comfortable guest bedroom, laundry room and full bath. The lower walk out level offers two bedrooms, a full bath and family room with access to a charming patio area. 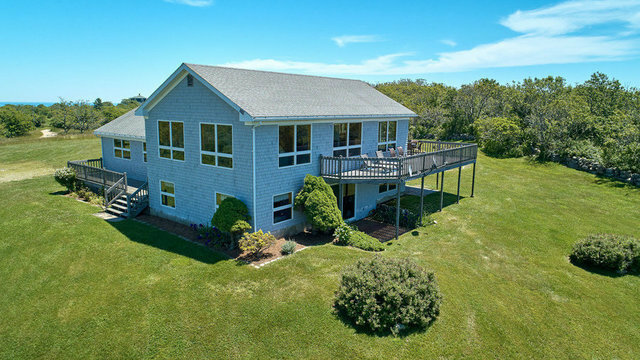 Add stunning views that range from expansive westerly sunset views to northerly vistas including the North Light, Sachem Pond, Block Island Sound and beyond and you have a property that must be seriously considered. Another wonderful feature: the property abuts 131 acres of conserved land on it southern boundary. Truly a winning combination on Corn Neck Road.